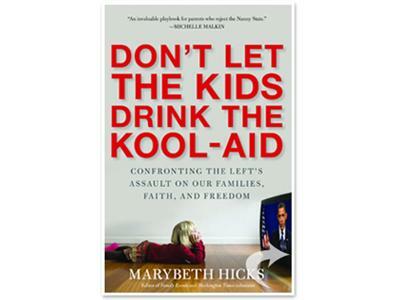 In Don’t Let the Kids Drink the Kool-Aid, Hicks exposes how the Left’s relentless attacks on America’s character and culture have finally succeeded, and are ushering in the first authentically socialist generation of Americans who believe they are entitled to a lifetime of government care. We can’t maintain the kind of system our Founders built for us without the kind of people who built it. Period. Marybeth Hicks is a weekly columnist for the Washington Times, the editor of the e-newsletter Family Events, a guest on many radio and television shows, and a frequent speaker across the country. A former writer in the Reagan White House, she is the author of Bringing Up Geeks: How to Protect Your Kid’s Childhood in a Grow-up-too-fast World and The Perfect World inside My Minivan: One Mom’s Journey Through the Streets of Suburbia. Marybeth Hicks’s columns and blog posts can be read at myfamilyevents.com. She and her husband live in Michigan and are the parents of four children.